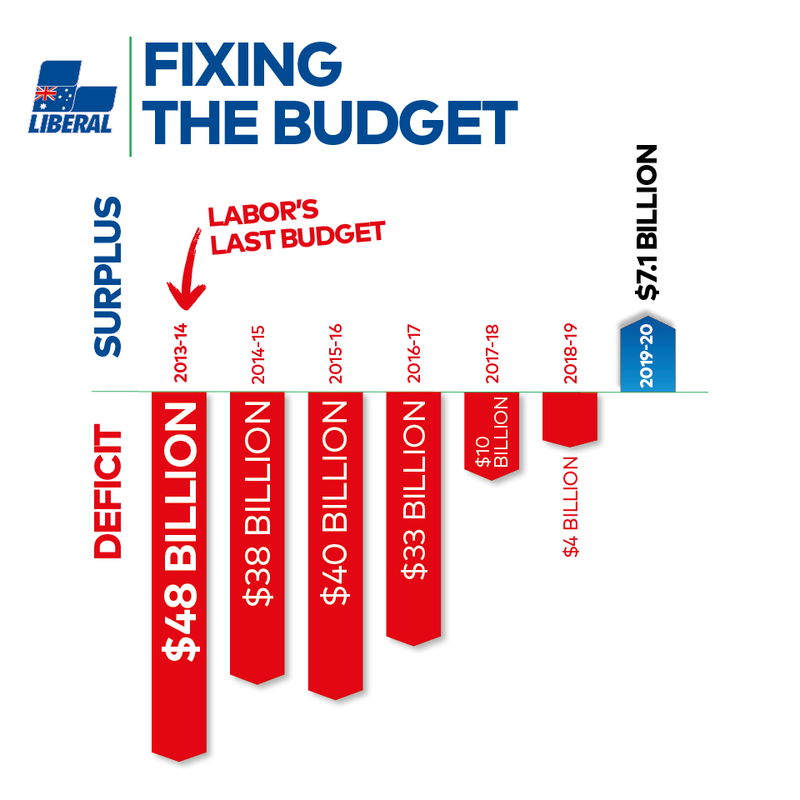 This year, for the first time in over a decade, the Government will deliver a Budget surplus. This means we can start repaying Labor’s debt and remove this burden within a decade. Create 1.25 million more jobs over the next five years. Keep Australia safe and our borders secure. Maintain budget surpluses and pay down debt. Deliver tax relief for families and small businesses. Guarantee increased investments for schools, hospitals and roads. After more than a decade of deficits, the budget returns to surplus in 2019-20. It has been a long road from where this process started when the Government was first elected. In 2013-14, some five years after the Global Financial Crisis, the deficit was still the second highest in Australia’s history. Since then, the Government has made steady progress to repair the budget and chart a responsible path back to surplus. The Government has the record and the plan to grow the economy, to guarantee essential services and to keep Australians safe and secure. Our tax system provides reward for effort. The Government is delivering a better tax system through its Personal Income Tax Plan introduced in last year’s Budget. Disciplined fiscal management has allowed the Government to enhance its plan in this year’s Budget, ensuring that working Australians share in the benefits of economic growth. Immediate tax relief will flow to low- and middle-income earners of up to $1,080 for single earners or up to $2,160 for dual income families. Around 4.5 million individuals will receive the full benefit for the 2018-19 income year. Tax relief for low- and middle-income earners will support consumption growth and ease cost of living pressures. This additional relief is more than double what was provided in last year’s Budget. In 2024-25, the Government will make a further structural change to the tax system by reducing the rate of the middle tax bracket from 32.5 per cent to 30 per cent. Together with the legislated abolition of the 37 per cent tax bracket, this change will mean that 94 per cent of taxpayers are projected to face a marginal tax rate of 30 per cent or less in 2024-25. The Government’s enhanced plan maintains a progressive income tax system that also rewards effort and contributes to a strong economy. The Government is building a better tax system for Australian businesses. Small and medium-sized businesses are benefitting from lower taxes and better incentives. The company tax rate for small and medium-sized companies with an annual turnover of less than $50 million has been lowered to 27.5 per cent. This rate will be lowered further to 25 per cent by 2021-22 as the Government accelerates its plan to deliver lower tax rates. Similar timing applies to the increases in the unincorporated small business tax discount rate, which will increase to 16 per cent by 2021-22 (up to the cap of $1,000). The Government is increasing the instant asset write-off threshold to $30,000 and expanding access to medium-sized businesses with an annual turnover of less than $50 million. These changes will apply from 7:30pm (AEDT) on 2 April 2019 to 30 June 2020 and will benefit around 3.4 million businesses employing around 7.7 million workers. The threshold applies on a per asset basis so eligible businesses can instantly write off multiple assets. More than 350,000 businesses have already taken advantage of the instant asset write-off. Businesses will be able to benefit from the instant asset write-off as they grow, providing a direct incentive to reinvest in their business. Major Project Business Case Fund $250 million. New projects of $50 million. The Government is committing record funding to health, with total investment expected to increase from $81.8 billion in 2019-20 to $89.5 billion in 2022-23. The Government is continuing to guarantee and strengthen Medicare to ensure that Australians can access affordable and quality healthcare. To help patients with out-of-pocket costs, the Government is providing $309 million to improve access to diagnostic imaging. This includes access to Magnetic Resonance Imaging (MRI) scans for patients with breast cancer and increasing patient rebates for ultrasound and x-ray diagnostic imaging items on the Medicare Benefits Schedule (MBS) from 1 July 2020. The Government is also providing $187 million to increase patient rebates for 119 GP service items on the MBS from 1 July 2019. In addition, the Government is fighting the prevalence of heart disease by introducing a new item on the MBS for heart health checks and providing funding to HeartKids Australia for the Childhood Heart Disease National Action Plan. A new $448 million primary care funding model will offer improved care for Australians with complex and chronic conditions. Patients across Australia will have better access to lifesaving MRI scans, with the Government investing a total of $379 million since 2018 for 53 new MRI licences. Commonwealth funding for public hospitals is increasing in every year. The $1.3 billion Community Health and Hospitals Program is boosting health services across Australia in four priority areas: hospital infrastructure; drug and alcohol treatments; preventative health, primary care and chronic disease management; and mental health. Benefits Scheme (PBS), including life-changing medicines to treat lung, bladder, kidney and skin cancers, and leukaemia. The Government is delivering record funding for schools to improve student outcomes and drive excellence in our classrooms. Recurrent funding for schools will reach $19.9 billion in 2019, with average Commonwealth funding per student having increased from $3,755 in 2014 to $5,097 in 2019. By 2029, this funding will grow to $32.4 billion, an increase of 63 per cent. All school sectors will benefit with increased funding for public, Independent and Catholic schools in every year. Under our guaranteed commitments, all schools — public, Independent and Catholic — will be funded on a consistent basis of student need. Because no one knows the needs of a local school better than the school community itself, the Government is providing $30.2 million in 2019-20 under the Local School Community Fund. This initiative will allow school communities to identify their own priorities, such as upgrades to classrooms, play equipment and other school amenities. The Government is continuing to support access to preschool education and will invest $453 million to extend support for the 2020 school year. This will ensure universal access to a quality preschool education in the year before school, helping to prepare children for their future school education. The Government is committed to a world-class higher education system and is investing $17.7 billion in the university sector in 2019. This is projected to grow to more than $20 billion by 2024. In this Budget, the Government is providing $93.7 million over four years from 2019-20 for scholarships for students to study at a regional campus of a university or vocational education training provider. The Government has a plan to build on the more than 1.2 million jobs created since September 2013. This plan will ensure all Australians have the skills needed for the jobs of today and tomorrow. The Government is investing over $525 million to upgrade the vocational education and training (VET) sector. Technological change is transforming the nature of work for millions of Australians. New industries are emerging and existing industries are evolving, increasing demand for new skills. As the nature of work changes, Australians are expected to work in more jobs over their career. A responsive and flexible VET system will equip Australians with the skills they need today and in the future. It will deliver the skilled workers needed by Australian businesses. drive long-term reform of VET by providing consistent national leadership through a National Skills Commission. The number of people with a high level home care package has increased by 74 per cent between June 2017 and September 2018. The Government is making an additional 13,500 residential care places available from 2018-19 — the largest number ever in a single funding round. In addition, the Government is providing $60 million for residential care infrastructure. As the Royal Commission into Aged Care Quality and Safety goes about its critical work, the Government is taking immediate action to raise safety and quality standards. The Government has launched the National Plan to Respond to the Abuse of Older Australians, including $18 million to support frontline services, and a new National Hotline (1800 ELDERHelp or 1800 353 374). The Government is delivering City Deals with a total Commonwealth commitment of $5.7 billion to assist urban and regional communities to reach their full potential. Building on the success of the City Deals model, the Government is also rolling out Regional Deals. These will build on more than $3 billion of Government investment in regional communities since 2013. The Government is providing a further $200 million for a fourth round of the Building Better Regions Fund, bringing combined total funding including the National Stronger Regions Fund to $1.5 billion. This will create jobs, drive economic growth and build stronger regional communities. Regional Australia will also benefit from a new $220 million investment in improved internet and mobile services through the Stronger Regional Connectivity Package. The Government’s $100 million investment in regional airport infrastructure upgrades will improve airport safety and access across regional Australia. The Government is committed to protecting Australia’s borders, combating people smuggling in our region and deterring people from risking their lives at sea. In this Budget, the Government is continuing to invest in Operation Sovereign Borders to reinforce the security of Australia’s borders. The Government is investing to keep Australia safe and secure. Defence spending will reach 2 per cent of GDP in 2020-21. A record $200 billion investment in Australia’s defence capability over the next decade will strengthen the capacity of the Australian Defence Force, create jobs and open up new opportunities for Australia’s defence industry. The Government is improving the wellbeing of veterans and their families by providing early access to services, simplified access to treatment and improved care for veterans with complex circumstances. This continues the Putting Veterans and their Families First program and the Government’s $278 million investment in this program in the last two budgets. The Government is bolstering investment in our cyber security strategy to strengthen the defences of government IT systems to address key security vulnerabilities and improve our ability to quickly respond to cyber attacks. The Government is taking action to support affordable, reliable and sustainable energy. The Government has given the green light to the Snowy 2.0 project by committing to a $1.4 billion equity injection. The project will firm up intermittent renewable energy by bringing 2000 MW of new renewable pumped hydro capacity into the system that will provide up to 175 hours of storage which can meet the peak demand of up to 500,000 homes. Partnering with the Tasmanian Government, the Federal Government is accelerating the Battery of the Nation and Marinus Link projects by providing $56 million for the Marinus Link interconnector – a second electricity transmission connection between Tasmania and Victoria.This will unlock Tasmania’s hydro capacity and support more sustainable and reliable electricity for homes and businesses. The hydro projects of Snowy 2.0 and the Battery of the Nation will support more affordable, reliable and sustainable power to the National Electricity Market. The Government is delivering a program to underwrite new generation investment. This will support increased competition in the National Electricity Market and help reduce wholesale electricity prices. The Government has agreed to a shortlist of 12 projects which represents a combined capacity of 3,818 MW. This is equivalent to around seven per cent of the National Electricity Market. Our Climate Solutions Package will help ensure Australia meets its emissions target under the Paris Agreement. Building on the success of the Emissions Reduction Fund, the Government’s $2 billion Climate Solutions Fund will help reduce greenhouse gas emissions. It will also support jobs for Indigenous communities and diversify regional economies. The Government is establishing a Priority Transmission Taskforce to support timely delivery of transmission projects from the Australian Energy Market Operator’s Integrated System Plan. The plan forecasts transmission requirements for the National Electricity Marketover the next 20 years. The Government is supporting feasibility studies for micro-grids which would harness distributed generation to provide secure, reliable and affordable power to regional and remote communities. The Government will provide $284 million for a one-off, income tax exempt payment to over 3.9 million Australians to assist with their next power bills and cost of living expenses. The payment of $75 for singles and $125 for couples will be made to those eligible for certain social security payments. The Government will provide $8.4 million to help speed up gas supplies from the Northern Territory to the east coast market by opening up the Beetaloo sub-basin for exploration and development. The Government has responded quickly to support farmers and communities devastated by the North Queensland floods and weather events. $232 million has been made available to help North Queenslanders affected by these disasters. The Government is also creating a new $3.9 billion Emergency Response Fund to provide an additional sustainable source of funding for recovery from natural disasters. The recent floods particularly impacted the cattle industry. The Government will provide up to $300 million in grants to help flood-affected farmers rebuild damaged farm infrastructure, replace livestock and replant crops. The Government recognises that many will find it hard to meet their loan commitments until they get back on their feet. The Regional Investment Corporation will help flood affected farmers to refinance their existing debts. The Government is also working with banks to provide up to $1.8 billion of low-cost loans to support banks offering lower interest rates to eligible flood-affected primary producers. The Government is helping flood‑affected schools and students, providing $4 million in financial assistance in 2018-19. Drought still affects many farmers throughout the country. The Government is providing $6.3 billion in assistance and concessional loans to support those affected by drought. The Government is helping struggling families pay their bills by increasing their access to income support and by providing $35 million to charities in drought‑affected communities. The Government is providing $29 million of funding for increased mental health and wellbeing support for farmers in hardship in drought‑affected communities. The Government is investing $3.9 billion in the Future Drought Fund to prepare for future droughts. The Fund will grow to $5 billion over the next decade and enable the Government to invest $100 million each year in water infrastructure and drought resilience.